The Dubai Autodrome is located in Dubai, United Arab Emirates. This motorsport race circuit opened in October, 2004. It was designed by Apex Circuit Design. Since 2006, the Dubai Autodrome continues to be the home for the Dubai 24 Hour, which is a touring car and sports car endurance race that is open to both semi-professional and professional teams. The circuit is over five kilometers long and is one of the world’s most modern race courses. Also, it is a very challenging course because it has a mix of high-speed straights with various technical corners. This venue belongs to the Union Properties Motorcity organization in the Dubailand area. This circuit, has six different configurations, and was designed so three separate racing circuits can run simultaneously, as well as safely from each other. Because of this unique feature, circuit users have unparalleled options. The Dubai Autodrome was built to meet strict safety requirements. It is the first Fédération Internationale de l’Automobile, or FIA, sanctioned circuit to include wider asphalt run-off areas. There is a surveillance system that provides full coverage of all parts of the race track. The system is connected to the control room for overall monitoring which includes saving the data on hard-disk recorders. Because of this, every occurrence on the track during an event or race can be observed. The facilities are mostly housed in the modern, two-story ultra complex that faces the grandstand. The facilities include the media center, race/safety control room, pit complex, timekeeping room, steward’s room and VIP suites. Additionally, there is a world-class medical center which is located behind the circuit’s pit area for all track emergencies when major events are run. Right behind the pit area is the traditional racing paddock which is used by the hospitality and team staff. 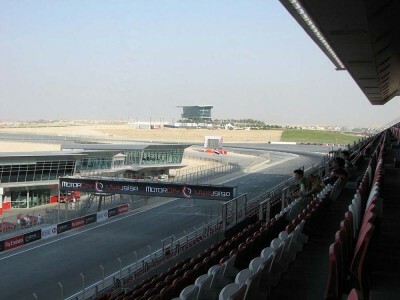 The Dubai Autodrome provides a one-of-a-kind facility for VIPs so they can enjoy motor racing in a luxurious atmosphere. These VIP suites give guests a wonderful view of the exciting race action because they are very close to the course. Race control authorities observe each event through the closed-circuit television system, which monitors the entire circuit. The track is run by very stringent international standards. There are staffed marshal posts, as well as safety trucks, paramedic services and an ambulance that are on hand throughout all major events. The race and drive center is the first one in the Middle East. It caters to both the novice and experienced driver. It is a great place for drivers to perfect their driving skills. Classroom instruction and behind-the-wheel training are available to provide in-depth knowledge about the most current race driving techniques. There also is the Kartdrome which has indoor and outdoor race tracks, along with state-of-the-art go-karts. In recent times, the Dubai Autodrome has intentionally positioned itself to be the new home for the United Arab Emirates national motorsport. Their goal is to develop and also promote UAE racing at the national level. The venue already hosts races for the following: UAE Sportbikes Championship, UAE GT Championship and the UAE Touring Car Championship. Other races include the Radical Cup, Trofeu Maserati, Formula Gulf 1000, and the Suzuki Swift Cup. The highlight of the circuit is the Dubai Motorsport Festival, which is very popular with local people and tourists.